You should enter the corresponding recipes for your menu items here. Outlet Specific: By default, any added recipe is visible across multiple outlets. If this recipe is specific to a particular outlet, choose this option. Note that this recipe will not be visible in other outlets, if this is selected. In a multi outlet scenario, a recipe can be prepared in another outlet, for e.g. centrally produced but transferred and sold in other outlet(s). In such cases, choose the manufacturing outlet from the dropdown. Ignore if this recipe is produced in the same outlet. This will take effect only for the outlet within which the recipe is added. 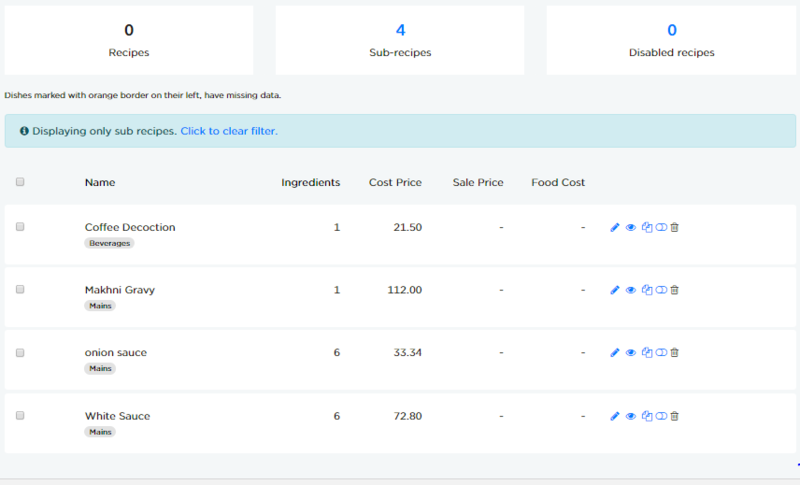 Other outlets where this recipe is visible by default may show a different cost price, as all ingredients may not be present. In such cases, you need to set the right manufacturing outlet for every outlet from where you want to view this recipe. Enter the output(yield) of this recipe/sub-recipe in quantity and unit. Multiple yields can be added here, as can be seen in example 1 for food sub recipe below. This is required to accurately cost the recipe when different units of this recipe are used and define conversion from one unit to another. For recipes that are sold directly, this will typically be in portions. Additional data for food sub recipes and liquor recipes may be required since it can be used with different units while adding to a main recipe. The above sub recipe can now be used in Kg/g in main recipes or also in portions. This means that specific sub recipe&apos;s 1 portion is equal to 1 kg. Here we link the recipe with corresponding menu item(s). This way we can identify the gross margin for each item in your menu. A Baileys recipe will contain 1 bottle i.e., 750 ml. Here we say that a large is 60 ml of this recipe and small is 30 ml. If you are selling the bottle directly, even that can be added. In this case, 4 different beer items are linked to the same recipe, some items have different selling price, some have similar quantity. Typically you would produce beer in 900 - 1000 litres in your microbrewery. So ensure beer recipe is added for what quantity you produce. Note that this linking is not required for recipes or sub-recipes that are not sold. In the above example, 4 sub recipes are listed out. Selling price and Food cost columns are blank since it is not sold as a menu item. All ingredients with respective quantities and units are entered here. 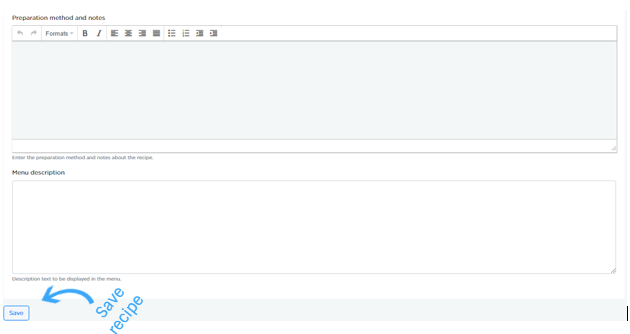 The dropdown will show you both ingredients and recipes, clearly highlighted for differentiation. For e.g. you can select Onion sauce if it is made in house, or if purchased add as an ingredient. Recipes also contain sections to segregate the way you are preparing them. For e.g. marination, base, decoration, etc., can be entered as sections. The ingredient quantity should be in "as purchased" form and not &apos;yielded&apos; form. Yield is captured separately for every SKU. For e.g. if chicken leg has an yield of 80% and your recipe needs 100 g of usable chicken leg, the entered quantity should be 125 g. Because 125 g with yield of 80% will give you 100 g.
Note that any given ingredient can be entered only once within a section. If you need to enter an ingredient twice, add a section. You have the option to add sub-sections for a recipe using Add section button and add the sub-section itself as a recipe using Add as Recipe button. This is recommended if a given sub-section is commonly used across multiple recipes so that it can be used as a single sub-recipe. In the above example, &apos;Onion sauce&apos;, a sub recipe is added as an ingredient. If &apos;Onion sauce&apos; is a purchased item, it will be highlighted as SKU. Record your preparation methods here, this will help in training your new staff. Record the menu description here. For e.g. Pan Seared Chicken Breast with lemon and tomatoes. Click Save button to save the recipe.